Enter cover dimensions here. Add corner radius measurement. See Below for Details on Entering These Values here or contact us for assistance. -- None -- 2" 3" 3.5" 4" 4.5" 5" 5.5" 6" 6.5" 7" 7.5"
Order any replacement hot tub cover for your spa - most makes and models. Free Shipping on this spa cover anywhere in the continental USA. Select from the select color swatches. There is no extra charge for any of our cover colors. Most popular colors are brown and gray. 2. Add Measurements - Enter your spa cover Dimensions in the Cover Dimensions box above. Include length and width (in inches) for square/rectangular covers. 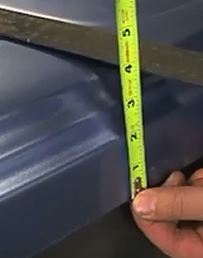 First dimension provided is the A measurement and is usually the longer one for rectangular covers. 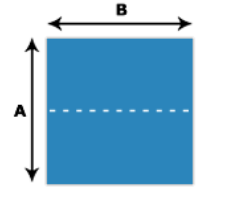 If cover is square, then A and B are the same. The fold of the cover bisects the first dimension A. Covers over 96" are oversized (addl. charge). Maximum dimension is 102". Anything larger will need to be at least a TRIFOLD COVER. Also include your spa manufacturer/model name/model year if known in the Dimensions text box. You can always send a picture/drawing to info@hottuboutpost.com for odd-shaped covers, cut corners, or those with raised speaker or other unique cover features. Most covers are either square or round with or without rounded corners. 3. Corner Radius if Rounded Corners - If your cover has rounded corners instead of squared off corners, provide the corner radius measurement. Provide the corner radius measurement in inches in the Cover Dimensions box above. . See below if you need additional tips measuring the rounded corner radius. You only need to measure one corner. C measurement is the corner radius for Rounded Corners. Write In Radius: x inches in the dimensions box above along with length and width and we will round off the four corners with the desired radius. Bonus: Enter Spa Manufacturer and Model if you know this information - we may also be able to double check your measurements if you add spa make and model with our huge cover database to assure a great fitting cover. Hot Tub Cover Features: These are Nice Covers! Our custom made spa cover based on your own measurements is made of high quality vinyl materials. We also offer oversized and free-form spa covers. Premium marine-grade vinyl is treated with mildew and UV inhibitors for a high quality spa cover. Upgraded denser 1 1/2 lb. Foam Core Inserts included (we would not build or recommend the flimsy 1 inch foam density used by cheaper online outfits) - or upgrade further to 2lb. foam density if desired. Heat Sealed Poly Vapor Moisture Barrier to prevent water-logging - upgraded vapor barrier included. Unlike cheap covers on the market, this cover also includes inhibitors in both the vinyl and thread to prevent premature aging of your spa cover. Heat Sealed Poly Vapor Moisture Barrier to prevent water-logging- upgraded vapor barrier included. Select your cover color from the color swatches above. Want a different color from our expanded color selection below? Email us at info@hottuboutpost.com for current custom color quote. When you order a custom cover, we will be in touch with you by email to confirm your dimensions so we get the cover right and also assist you in case any additional measurements are needed. Insert your cover's measurements above to get us started. We will contact you by email to confirm the dimensions and anything else we need prior to producing your cover to assure your satisfaction. Measurements you will need depending on your style of cover will include length, width, corner radius if rounded corners, and skirt length (flap length around edge of cover). For round corners, we only need the diameter or radius of the cover along with skirt length measurements. You can also send us an email (support@hottuboutpost.com) or call us for assistance. Please allow appx. 3 weeks for spa cover production and about 3-6 days after completion for shipment. Each cover is handcrafted to your specifications and desired color. We will confirm your order with you prior to production and also update you with tracking information when shipped. Note delivery is curbside by common carrier. Shipper will contact you directly to make local delivery arrangements. Covers up to 96" in size are standard. Covers up to 102 inches are oversized (addl. cost) . Any oversized cover over 102 inches - contact us or see our Trifold cover if 3 panels are needed. If you are ordering a cover for a QCA Spa or Emerald Spa, we may have the cover in stock (brown, charcoal gray - mahogany, charcoal, spice ). Find your QCA Spas Cover by model name here. Or you can use this order form and mention the QCA or Emerald model number or name. If the cover is in stock (brown or charcoal), it will ship out in about 2 days. Allow 3-5 days shipping time to receive the cover. If the desired color is not in stock, it will be treated as a custom cover order and takes about 3-4 weeks from the time we confirm your order with you until you receive your custom cover. To determine the radius of your cover's corners, take a sheet of paper and trace around one of the curved corners of the cover. You will get a curved line similar to those shown at the left. Remove the paper and complete the circle. You can do this freehand. Then measure across the middle of the circle you drew, and divide by 2. Another better way to measure the radius is by placing a carpenter's square on the outside of your spa. The distance (A) between the corner of the carpenter's square and the place where it touches the spa equals the radius of the curve (B). This is the length of the flap that hangs down around all of the sides. It is usually about 4-5 inches long, but we will make it to whatever length you prefer or length of your existing cover's skirt length. Just add skirt length: x inches to the dimensions box above (under the color selector) when ordering. Cover Types - This is for your reference - we will contact you for any missing or needed information prior to producing your cover. For rectangular covers, we will make the Fold bisect the longer side (cuts longer side in half). 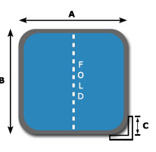 This is also the same way of saying that the fold goes across the shorter dimension unless you request differently. 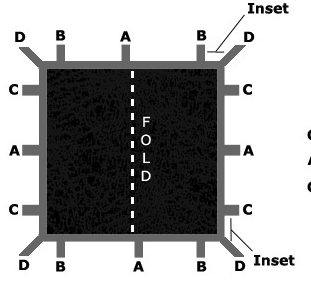 Standard Fold cuts longer end A in half. 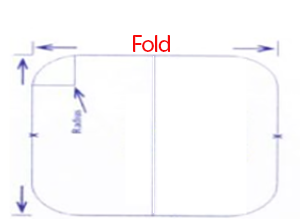 Standard Fold on Rectangular Covers has the hinge going across the shorter side. (That means the long side is split in 2 when folded over). When specifying dimensions, the first side is the A side that will be cut in half - usually the longer side on a rectangular cover. We give you more control on ordering your cover - enter your desired dimensions and corner radius along with spa model information if available into the Cover Dimensions box above along with any other notes. We will contact you to confirm your order prior to beginning production. Square or Rectangular Cover = L x W (these are simple, just provide length and width) - if no corner radius is specified, we will build the cover with 90 degree corners and no rounding. 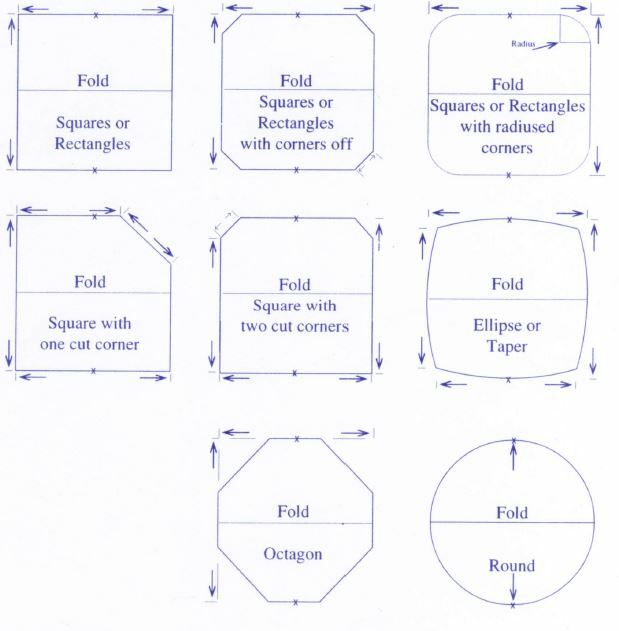 Square or Rectangular Cover with cut corners = L x W x Cut Corner Dimensions (we will send you a drawing to confirm measurement for cut corner spa covers) - there can be 1 cut corner, 2 cut corners, 4 cut corners or other configuration. Order any custom cover above - or send us an email at support@hottuboutpost.com with your spa model/cover details and preferred color. If spa manufacturer/model/model year is known, add it into the details box along with the cover measurements so in the case a template is available for your model, we can compare database dimensions to the ones you provided with the order. Custom covers are non-returnable/non-refundable as they are produced to your specifications and dimensions. 4 straps are included, 2 on each side of cover at the locations C (also called 2N2S strap location) - any other strap location is custom and needs to be specified. 2 standard handles are included (at the 2 locations of A that are between the straps C) - upgrade to black rubber handles from standard handles available. Allow appx. 3 weeks for cover production and about a week for shipping depending on your location. You will be contacted by shipper at the phone number you provide at checkout to arrange delivery. Cover manufacturer has ASTMF/UL certification and is a respected member of the NSPI. Nice product! Well constructed. Fits tub nicely. Floating Soft Top Foam Cover 82" x 88"